I am dedicating this post to all of my friends who have either been following the Whole 30 this past month, eating their own version of clean or completely avoiding alcohol for a dry-January. I sincerely salute all of you for your commitment and determination, not to mention your willpower. For me, I just worked out for the first time in two weeks yesterday and I could only finish 3/4 of my session. I am still not feeling 100% so needless to say I am likening myself to a slug compared to the above referenced girlfriends. Sigh. But you know what? Over it. It’s the Patriots Bowl Super Bowl this weekend (see how I did that) and it’s time to bring on all the snacks that are going to be easy to eat while we cheer our New England team to victory! At one point, I considered posting a recipe for delicious and pretty healthy Turkey Carnitas that I adapted from from a Bobby Flay cookbook appropriately named, Bobby Flay Fit. Carnitas definitely qualify as Super Bowl eats and think of the guacamole! But then, I was bombarded with images of all the yummy snacks that are associated with game day and thought, maybe I should offer you something more decadent and save the carnitas for another post. Let’s throw caution to the wind for the evening, shall we? Let’s enjoy some decadent eats with a few healthy things thrown in, but only for good measure. There’s a time and a place for big salads with 4 ounces of protein and a side of sauteed kale. The Super Bowl is not that time imo! Before I get to today’s recipe, let me just direct you to a few slightly healthier recipes on The Kitchen Scout for that little bit of good measure I mentioned. Perhaps whip up a batch of my Sauteed Onion and Yogurt Dip that has so much flavor but is lighter than its heavier relations. Or my Roasted Carrot Tapenade can serve as a dip, or as a condiment to grilled chicken or a spread on a sandwich later in the week. Horiatiki Hummus takes the everyday chickpea spread to a new level and Bacon Wrapped Brussels Sprouts speak for themselves. 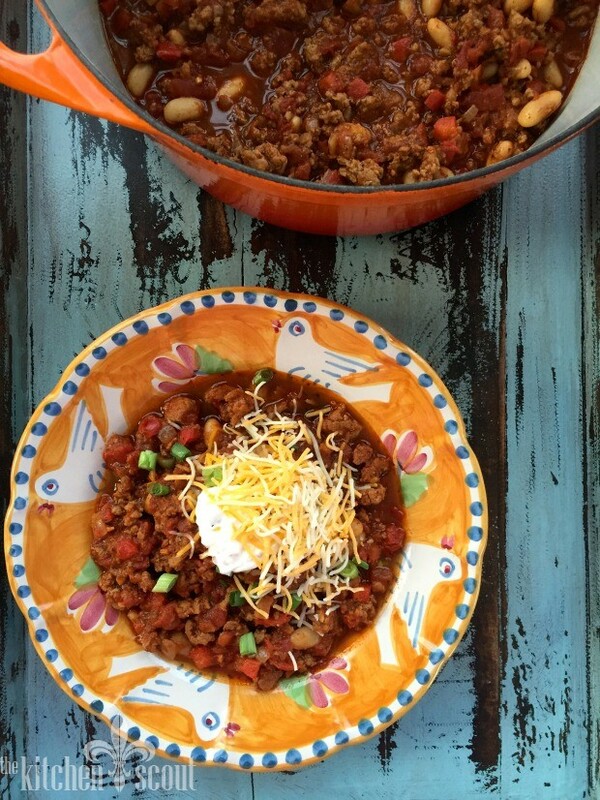 At the end of the post are a few of my slow cooker favorites and a turkey chili that are perfect for game day eats. 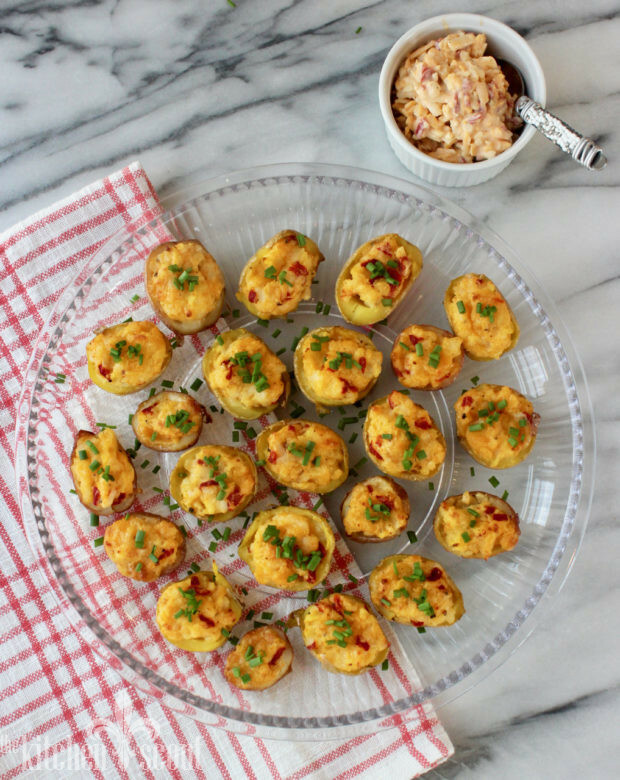 Today’s recipe for Double Stuffed Potato Bites was inspired by Smitten Kitchen’s Pimento Cheese Potato Bites. I’ve changed the recipe in two ways. Deb boils her potatoes and I chose to roast them for more flavor. 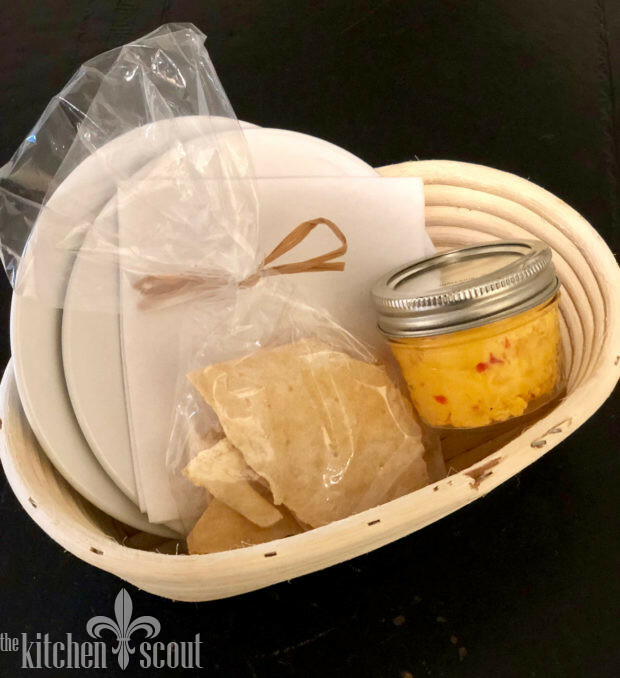 She also has what looks like a pretty basic Pimento Cheese recipe and I turned up the volume by using a recipe from The Blackberry Farm Cookbook that I read while visiting the farm with my husband this past Fall. I renamed the recipe because for some people, the word pimento seems to be off-putting and if you are one of them, you would miss out on the deliciousness. In fact, I actually replaced the pimentos with jarred Piquillo peppers that are available everywhere and have a lot more flavor so there’s that too. My history with pimento cheese isn’t too long. I think I first learned about it from my friend, Kathy but I can’t remember if she served it to me or we just chatted about its existence. But once I tried it, I fell in love with what is often referred to as the pate of the South. Pimento cheese is truly a southern staple and it is used as a spread, a dip and even as a filling for sandwiches. Today, we’re putting a similar recipe in a potato. There are lots of ways to make pimento cheese. Some recipes have some onion, some have dill pickle juice, some have just cheese, mayo, pimentos and hot sauce. Some add celery salt and some use cream cheese. Blackberry’s version is deliciously complex with basic ingredients that include sharp cheddar cheese, Frank’s red hot sauce referenced by name, some apple cider vinegar for tang, Dijon mustard, minced garlic and a few other odds and ends. The only change I made to keep it looking traditional was to swap out some of the white, sharp cheddar with some orange, extra sharp cheddar. Do it! Or don’t, but use the extra sharp all the way. 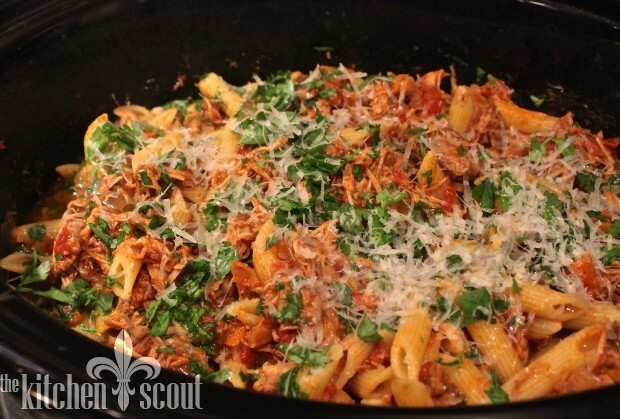 And don’t be tempted to use pre-shredded cheese because it will taste much better and fresher if you grate it yourself. It takes no time. While the potatoes are roasting, you can prepare the Piquillo Cheese Spread that serves as the filling. It makes almost twice the amount you need for the potatoes as did Deb’s version. I actually cut Blackberry’s recipe in half so know that you can easily double it if you want. Serve leftovers with crackers or in a sandwich later in the week. You could also roast more potatoes if you want! If you have the time, you could make the cheese a day or two ahead to allow the flavors to develop but if you make the recipe all in one day as I did, they will still be delicious. Once you are ready to assemble the potatoes, you will mash the filling and mix it with some of the Piquillo cheese. Divide the mixture among all of the potato cups and bake until bubbly. Top with some chopped chives to make them pretty. 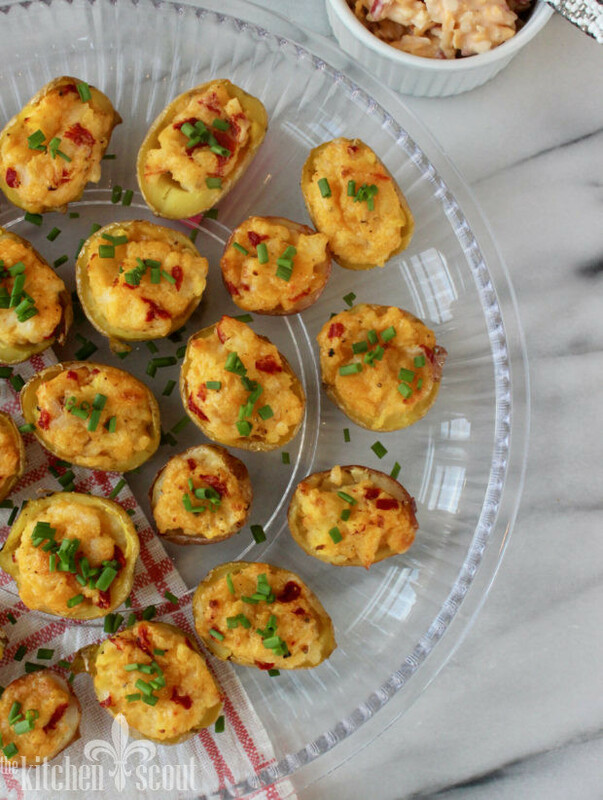 Everyone who tried them loved these little bites and I really think they will be well received at your Super Bowl parties. My friend, Adam suggested bacon would be a nice addition and to be honest, I like his way of thinking! Either way, I hope you give this recipe a try and a shout out to Smitten Kitchen and Blackberry Farm for the inspiration! Oh and of course, Go Pats! This recipe is inspired by Smitten Kitchen. 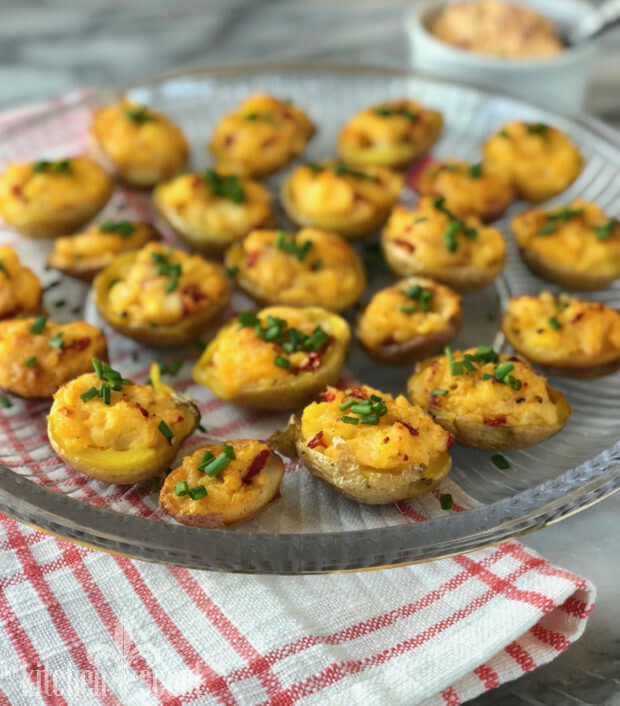 Roasted baby potatoes are stuffed with a Piquillo Pepper Cheese Spread based on the Pimento Cheese Spread recipe from Blackberry Farm in Tennessee. Little bites of double stuffed potatoes are fun for serving on any occasion! The recipe for the cheese spread makes more than you will need but you can serve it with crackers, crudite or as the filling for a sandwich as they do in the south if you want. You can also roast extra potatoes! Enjoy! Preheat the oven to 400 degrees with a rack in the middle. Clean the potatoes with a damp cloth. Place them in a large bowl with a drizzle of olive oil, a sprinkling of kosher salt and freshly ground black pepper. Toss them around until they are glistening. 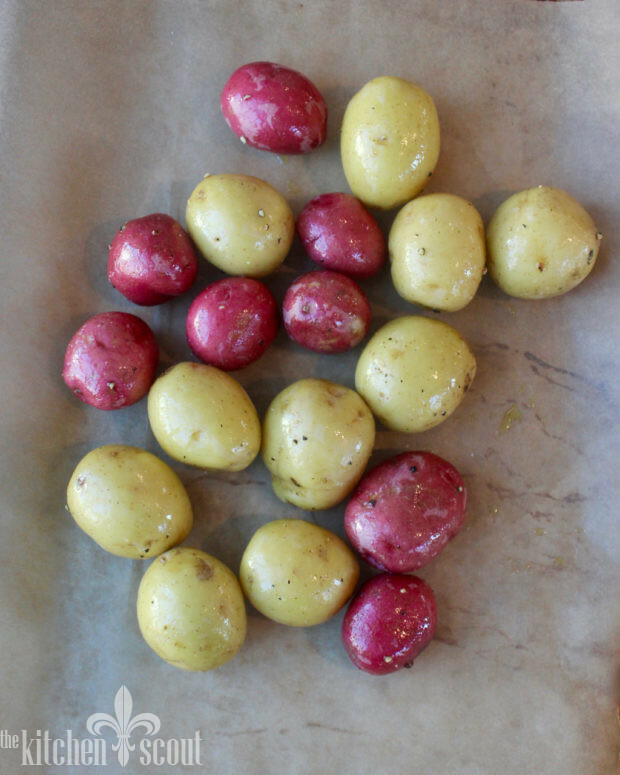 Spread them out on a sheet pan lined with parchment paper for easy clean up. 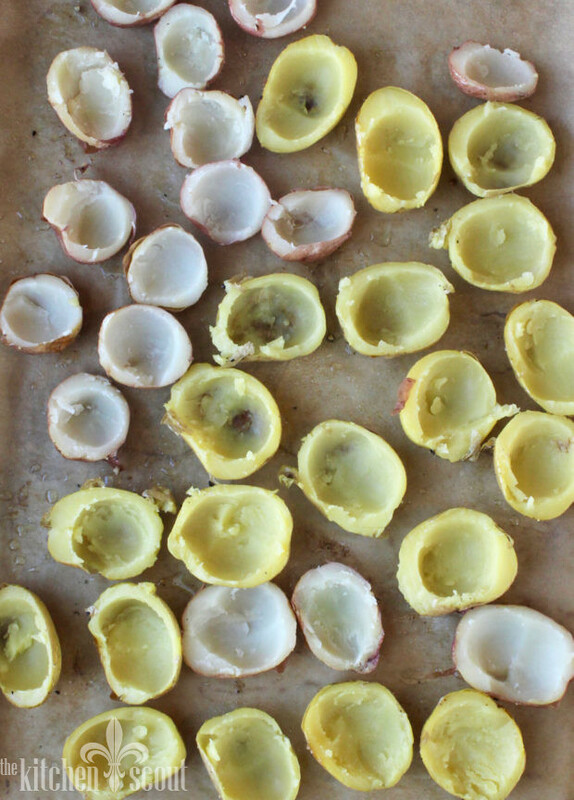 Bake the potatoes for 30-35 minutes until a knife inserts easily. Set aside to cool. The potatoes can be made up to 2 days ahead and kept in the refrigerator. While they are baking, prepare the cheese. In a large bowl, toss together the cheeses and the piquillo peppers. In a small bowl, whisk together the mayonnaise, vinegar, hot sauce, mustard, garlic, salt and pepper until smooth. Add the mayonnaise mixture into the cheese mixture and stir until it is well blended. You can transfer to an airtight container and refrigerate for up to 2 weeks. You will only need about half to proceed with the recipe. Serve leftovers with crackers. Once the potatoes have cooled, slice them in half lengthwise. Using a melon baller if you have one and a small spoon if you don't, scoop out all but the last 1/4 inch thickness of potato and place it in a bowl. Arrange the potato cups back on the baking sheet. Season the cavities with a little salt and pepper. Mash the potato centers until smooth and mix with 3/4 cup plus 1-2 Tablespoons of the cheese mixture. Season with more salt and pepper to taste (start with 1/4 teaspoon of each). Divide the mixture among the potato cups, packing the filling down as best as possible so it doesn't ooze out. Bake 15 to 20 minutes until the cheese is melted and they are warmed through. 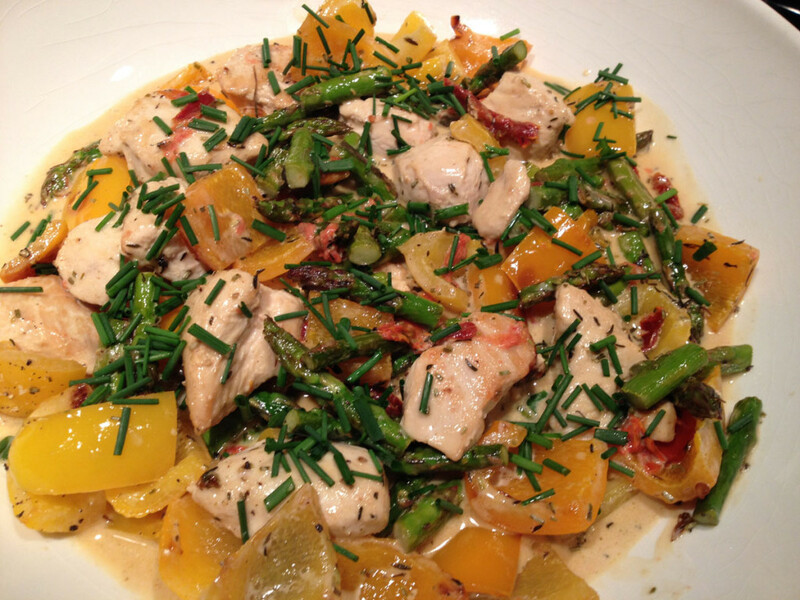 Let cool for just a few minutes and garnish with chopped chives for serving. The pimento cheese at Blackberry Farm is the very best! 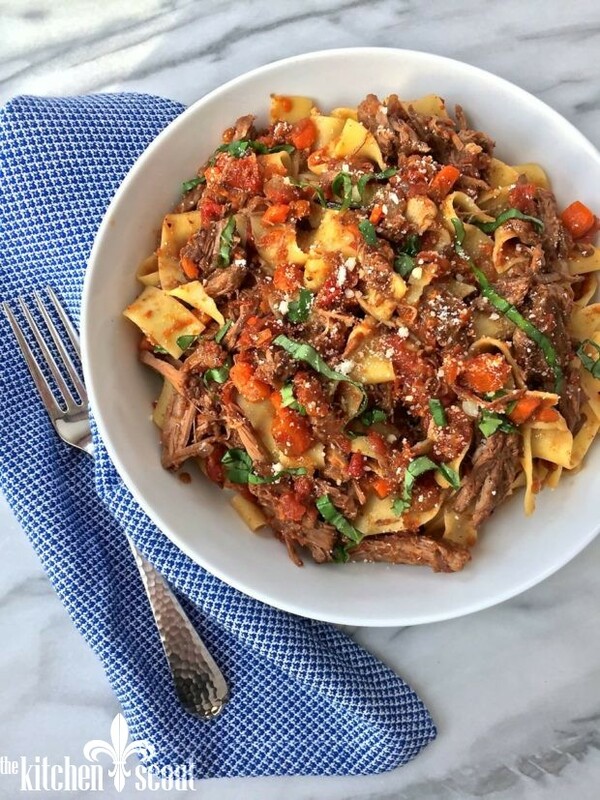 It turned me into a big fan and I’m so happy to have the recipe–and your updated version. Thanks Val. And go Pats! I need to go back there someday!